The rain in Spain stays mainly in the plain. And if you live in California (which, it turns out, I do now), the rain stays mainly somewhere else. Except, of course, when it doesn’t. I don’t know what I’m getting at here. I think basically that sometimes you just need to watch My Fair Lady instead of vacuuming your apartment or doing your laundry or, you know, being employed. Sometimes. 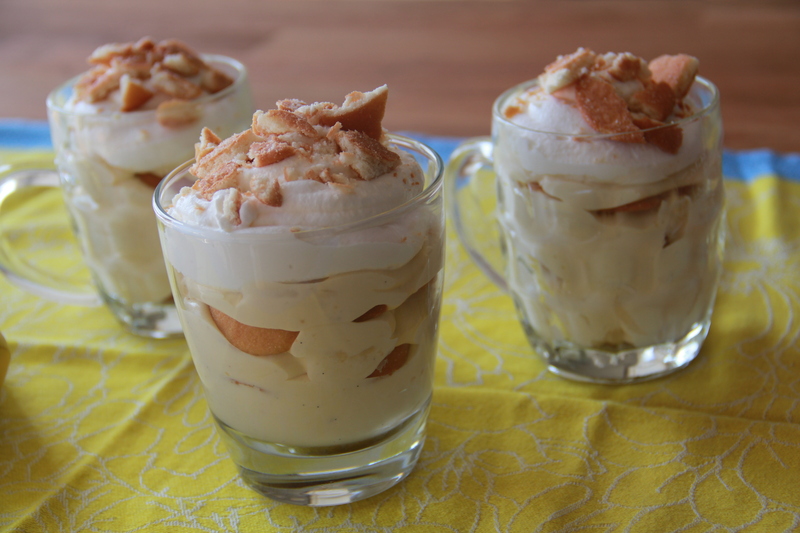 Other times you need to make banana pudding. Like when your cousin Aaron comes over with his electric drill and builds you a whole closet so you no longer have to live out of a suitcase; that is a good time for banana pudding. Aaron is the sole member of my family who lives here in San Francisco — the only one who also lives out West at all, actually — and I’m so glad to have him here. He makes this strange and wonderful city seem a bit more like home (he built me a closet, after all), and for that I am so very grateful. So, you see? 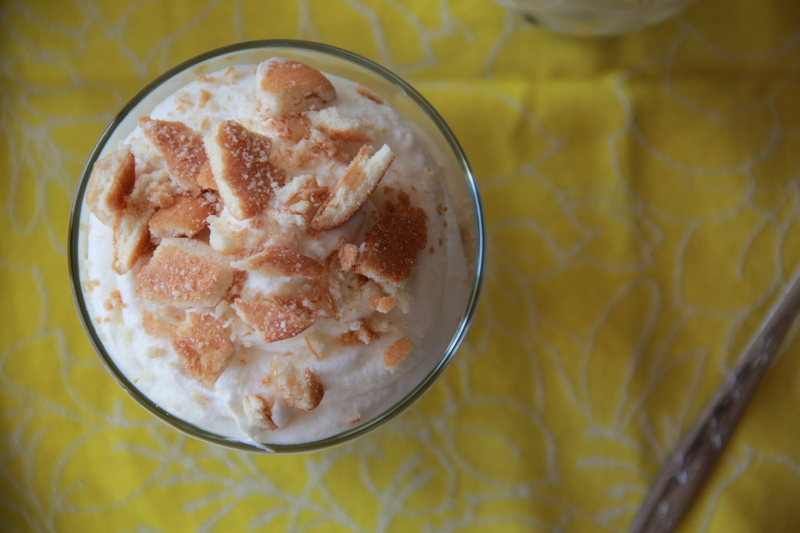 Banana pudding, with cookie crumbs and soft whipped cream and specks of whole vanilla bean. It’s time. First, make vanilla pastry cream: put the milk, about half of the sugar, and the vanilla bean in a medium saucepan, and heat over a medium-high flame. In a medium sized bowl, whisk together the remaining sugar and cornstarch, and then thoroughly whisk in the egg yolks, until smooth. Once the milk mixture starts steaming and bubbling at the edges, remove it from the heat and, slowly, pour a third of the milk into the sugar/cornstarch/yolk mixture, whisking constantly to combine (this is called tempering the eggs). Return the tempered egg mixture to the saucepan and place over medium heat, continuing to whisk. Don’t stop whisking, or the pastry cream will turn out lumpy and may scorch in certain spots. As you whisk, the mixture will become thicker, and will start to boil. Once boiling, continue whisking for a full two minutes, and then remove the pot from the heat. Pour the warm pastry cream into a clean bowl, and press a piece of plastic wrap directly on it’s surface, to prevent a skin from forming. Cool the pastry cream in the refrigerator. While the pastry cream is cooling, whip the cream with the confectioner’s sugar and vanilla extract until it holds soft peaks. Set aside (keep cool in the refrigerator) until ready to finish the pudding. To finish the pudding, use a stand mixer with a paddle attachment or whisk to beat the cooled pastry cream until it’s completely smooth and lump-free. Reserve at least 2 cups of whipped cream for the garnish, and then fold the remaining whipped cream into the pastry cream gently – it’s okay if it looks streaky, it will smooth out when the bananas get folded in. Slice the bananas into thin rounds, and gently fold them into the pudding mixture until well incorporated. To assemble the puddings, spoon some Nilla cookie crumbs into the bottom of a glass jar, then cover with pudding, and top with more crumbs. Keep layering crumbs and pudding until you only have one inch of space left at the top of your glass. Spoon some reserved whipped cream atop the last layer of pudding or cookie crumbs, and sprinkle a few crumbs on top as garnish. Repeat with remaining glass jars or cups. Store the pudding cups in the refrigerator for at least 4 hours and up to overnight, to soften cookies. Serve pudding cold, with extra spoons. Serves about 6. Pudding will keep up to three days in the refrigerator. This looks great. 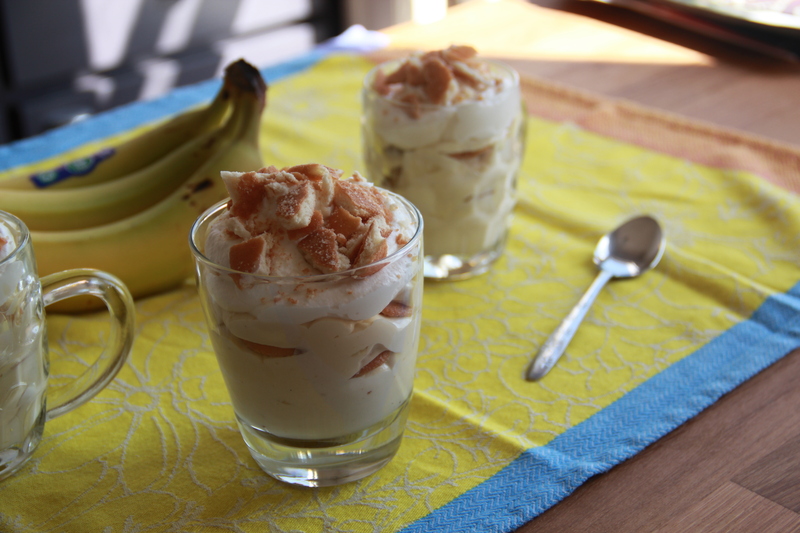 Banana pudding is my favorite dessert. I’ve never made it from scratch, so I might give it a try. Awww…aar bear built you a closet?! He deserves this yumminess.